Spice Up Your Life...With Yumi. Does it seem like your babe is aching for more out of the meals but not yet ready to upgrade? Well then open up the spice drawer and let’s get to work. Throwing in some spices can increase flavors in the little one’s meals and subsequently help develop your future gourmand. Quick note: If your baby is under one, it is recommended to NOT add salt to their food. That said, do not to fret, there’s an entire universe of spices to explore. In the same way you introduce new words to your baby to help them understand language, introducing a new spice exposes them to a new flavor profile and helps them get acclimated to a broad range of tastes. Consider the following suggestions a sampling of what’s possible. Feel free to pick and choose what works for you and your babe— you’ll know best when your little one is ready to try new ingredients, such as meat. We provide some rough guidance on how much to add, but you can increase or decrease based on taste. Always feel free to reach out and we’ll help you find the perfect combo. And share in the comments how you are putting the personal touches on making Yumi meals your own. Spice It Up: Three basic ingredients, many possibilities. If you’re not feeling a Tuscan White Bean Salad, why not go for chilis? Throw this in a pot with a bay leaf and some finely chopped poached or roasted chicken (you can do about a quarter cup). Stir slowly while heating over low to combine. Remove bay leaf and watch babe’s face light with joy at this delight. Spice It Up: Ahh carrots. Good for the eyes. Good for the soul. And, on that note, you can add some mushy peas to these mushy carrots. Another option, is to reach for the spice rack to add a dash paprika and cinnamon. Give this a final stir before serving to a baby that is about to see things a whole new way. Spice It Up: You may be thinking, how can one improve upon a delightful kiwi chiwa? Make it into a more textured yogurt parfait by adding toasted coconut flakes, or even a few blueberries to the mix! With blueberries, your baby will be able to practice their pincher grasp (feel free to cut them in half, if they’re not ready for whole berries). Spice It Up: ‘Tis the season for a dash of fresh nutmeg and a lil’ bit of chopped parsley. Simple, easy, happiness. Spice It Up: Explore India from the top of a high chair with a pinch of ground cumin and cardamom. It’s not quite a mango lassi, but it’ll be 10x healthier. 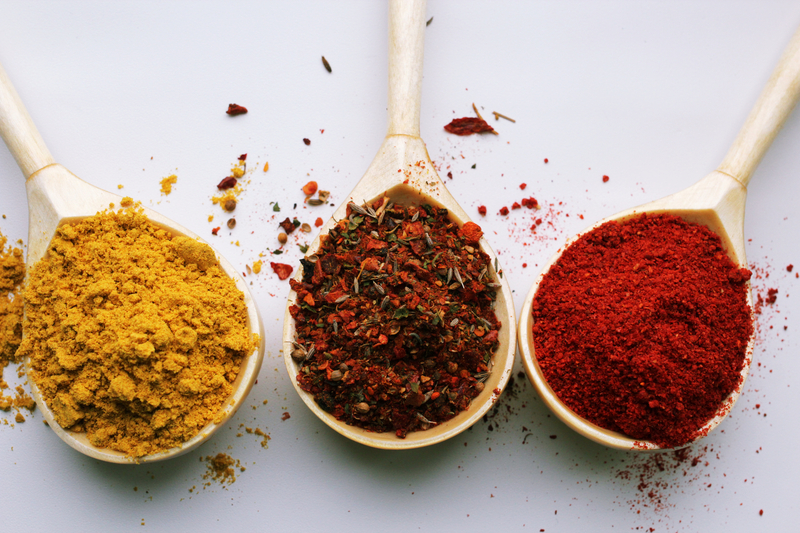 Spice It Up: A smidge of garlic powder will increase immunity and heart strength. Oregano will provide some flair. Spice It Up: Ever read the book “How to Be Parisian?” Neither did I but one of our doulas promised it was a great read. In it, it says to add herbs de provenance and some stewed meats* to just about everything edible. Serve with the pinky up and prepare to have a baby with attitude. Spice It Up: Looking to add some Mediterranean flair to your life but maybe don’t think you could make it to Greece without a certain someone waking an entire plane mid-flight? Turn your beet hummus meal into a mezze plate. Add a little put of olive oil (a great healthy fat) and put it on a plate alongside some cut pieces of a softly boiled egg and labneh. If your little one is ready for some bread, you can also add some warm pita to the mix. Spice It Up: Pears are tasty. So is greek yogurt. Put these two together and you have breakfast for one little babe. You can also add a dash of cinnamon to this tasty concoction.